Sunday I had the blessing of baptizing another child into the fellowship of the church. 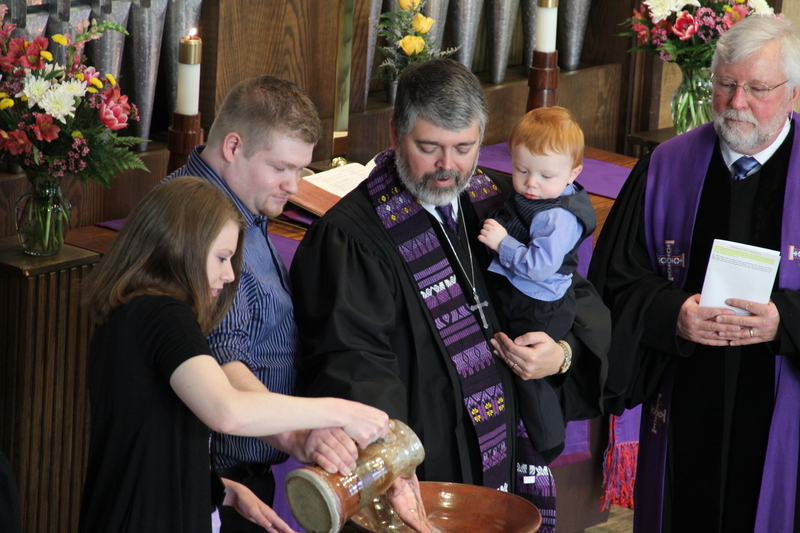 This was my second opportunity to offer the sacrament of baptism to a small child as a newbie United Methodist pastor. And, again, it was a great blessing! As I have become a part of the United Methodist Church I have been going through the “official” process of transferring my orders, receiving provisional conference membership, and studying to understand and gain a greater appreciation of Wesleyan theology than I did as someone outside looking in. But beyond the “official” work of learning to be a United Methodist there has also been meaningful and powerful internal changes which have effected my faith, my understanding of my relationship with Christ, and my spirituality. In this process the sacraments have become more alive for me, more meaningful, and deeper. Wesley’s theology of the Means of Grace and the radical openess of the Table makes Holy Communion not just an insider experience with Jesus but a wide open invitation to experience the converting grace and power of the gospel. The Table is/becomes an open door in which the church beckons all to come and join in the gospel feast. It is a means of grace, an experience of God’s love, and an experession of the connectedness of the body of Christ. Now I feel and experience so much more the prevenient nature of Holy Baptism when I take water in the name of the Trinity and bring a young child into the family of God. I’m not baptizing someone because they have figured God out, because they understanding all the commitments that are being made on their behalf by their parents, or even because they yet know what it means to believe. I’m baptizing them because God, from the very earliest moment of their life, loves them as God’s own dear child and claims them preveniently for the life of the kingdom. As a parent pours out her or his love on a small child, and as that child learns to respond in love by loving and caring example, so in baptism we experience the love of God and the love of God’s people and learn and act in response to the love and grace given by God and God’s people. In this Lenten Season the meaning of the Sacraments may be some of the best reminders as to what the church is about. The church is about radical hospitality, radical welcome, and radical openess. God through Jesus Christ invites all to the waters of baptism to experience a love and grace bigger than even adult minds can fully understand, God invites us to his table to eat with him, to remember his sacrifice and rejoice that he is coming again. The invitation is so radical that it knows no boundries. Come the water and come to the Gospel Feast! You will never come at all.. This entry was posted in United Methodist Church on February 29, 2012 by Tim.